Gateway Training provides high quality training solutions that have been carefully developed to meet the demands of today’s companies and organisations. You can be assured that by using Gateway Training you will receive the highest quality training that really benefits delegates – and at very competitive prices. Our training is designed to unleash the power in people by using techniques and activities that equip delegates to develop their skills and improve performance in their own day-to-day work environments. We are careful to consider the individual needs of each delegate and we tailor our courses to meet these demands. We are happy to offer a pre-course assessment if required to ensure that specific training requirements are met. We are always happy to receive comments at the end of courses which enables clients to provide feedback about the services we provide. All of our courses are run by trainers who really know their subjects and how to get their message across. Too many trainers know their subject but their delivery is poor. 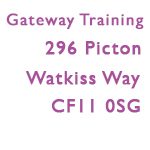 This is where Gateway Training are different. We make sure our training always is fun, easily understandable and relevant. We ensure that we give delegates access to the most up-to-date information backed by in-depth industry experience, guaranteeing that those attendees on our courses gain the benefit of a consistently high standard of training from knowledgeable, friendly and commercially aware trainers. As well as a huge range of set courses, we can also offer a highly personalised training service. We tailor programmes that are designed and run specifically for a particular client. We make sure that you get the training you need, when you need it – delivered only to the people that need it – and this often represents great cost savings. The development of a bespoke training service allows tighter control over course content, direction and exercises and ensures that the training is perfectly geared for a particular company and/or industry. Click here to contact us to find out more about our Bespoke Training service. If you have any questions or queries about any of our courses, or if you would like to discuss any aspect of the services Gateway Training offer, we are here to help. We are always willing to discuss how to best meet your training demands and how to make the most of your training and can offer our expert knowledge and experience to find the best possible solution for you. You can book your place on any of our courses in a number of simple ways. We make sure that the booking process is simple and our choice of booking methods allows you to choose the way that is most convenient for you. Click here to find out more about How to Book.